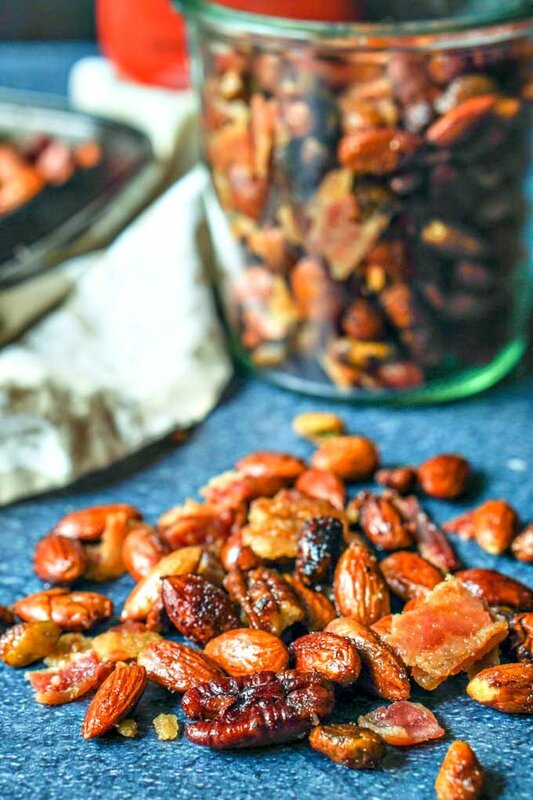 Maple Bacon Roasted Nut Mix - a low carb snack mix! 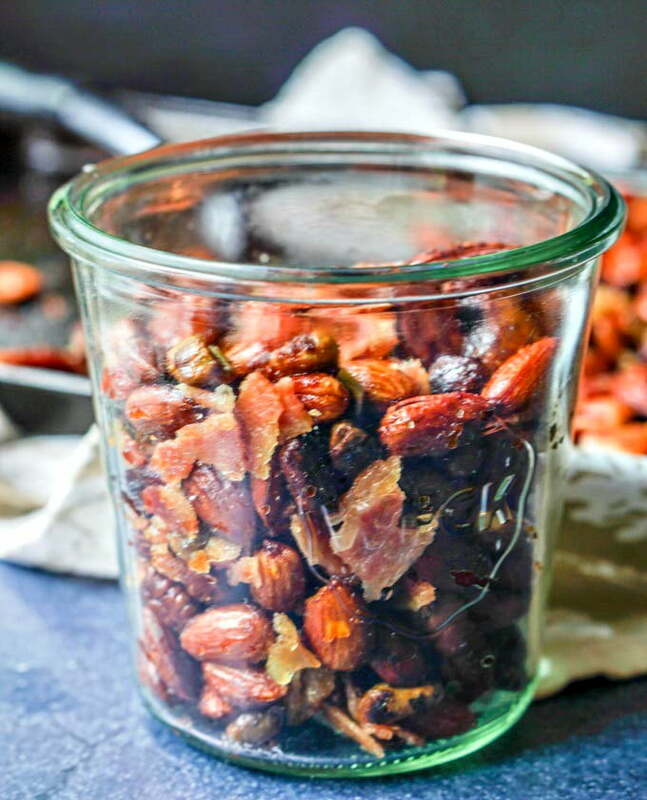 If you are looking for a new low carb snack, try this maple bacon roasted nut mix. 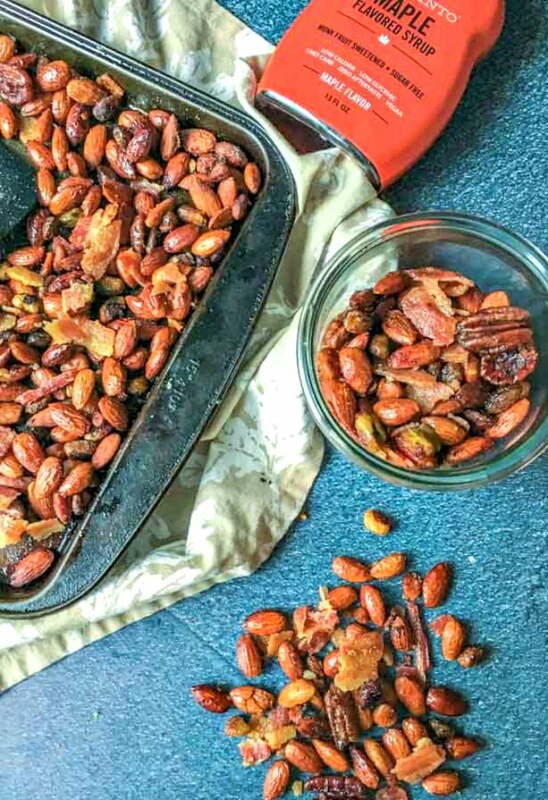 Bits of bacon scattered among roasted nuts that are flavored with maple make the perfect salty, sweet snack. Only 4.4g net carbs per serving. 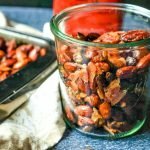 You might also like this low carb, slow cooker Thai curry nut mix! When fall comes around I always think of maple flavor as well as pumpkin of course. I’ve made low carb maple freezer fudge using walnuts along time ago because nuts and maple go so well together. With that in mind I also remembered my low carb maple bacon no bake cheesecake and thought how good bacon was with maple too. 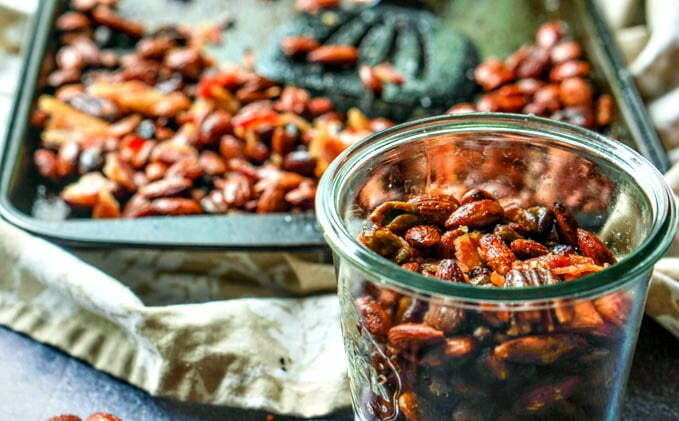 That’s how this low carb maple bacon roasted nut mix was born. It has a bit of sweetness from the maple syrup, crunch from the nuts and some rich, saltiness from the bacon. Yum! As you may know I am an avid Aldi shopper and I bought most of the ingredients there. I used their thick cut bacon and this awesome raw nut mix pictured below. 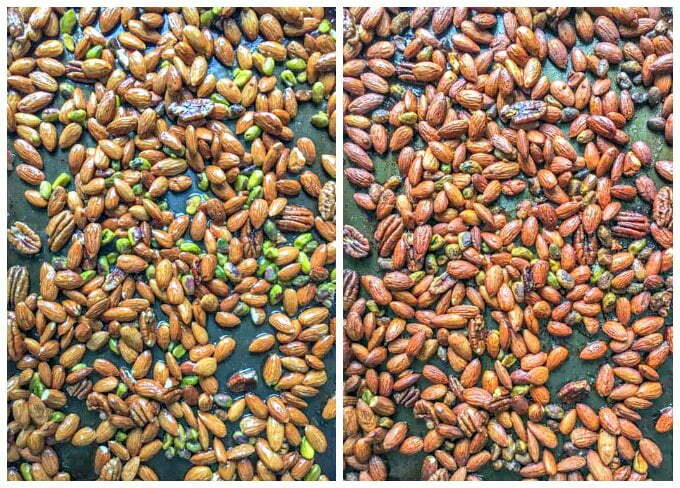 As you an see it has almonds, pecans and pistachio kernels which was perfect for this recipe. Lakanto maple syrup (pictured above): This is very tasty but it is not a concentrated maple taste. It would be perfect for pancakes but for recipes like this you need to use a bit more than regular syrup. However it uses erythritol and monk fruit extract which are two natural sweeteners I love together. Walden Farms sugar free syrup: This one was very sweet and thick however it has all kinds of stuff in it so I didn’t want to try it in this recipe. However it is very easy to find in grocery stores. 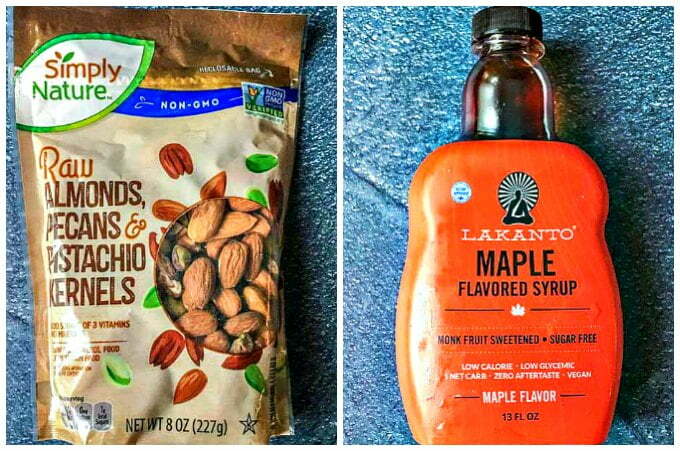 Nature’s Hollow maple syrup: This brand is also very good and it uses xylitol which is fine but I liked the Lakanto better. maple syrup extracts: I really like using extracts lately as they give a lot of flavor but they are not sweet so you have to add a sweetener to the recipe. However you can find maple extract just about anywhere. You can find all of these products in my Amazon shop if you are interested. This is as simple as simple can be. You start with making your bacon in the oven. Lay the bacon on a cookie sheet and bake until the bacon is done. Then take out the bacon, crumble and set aside. 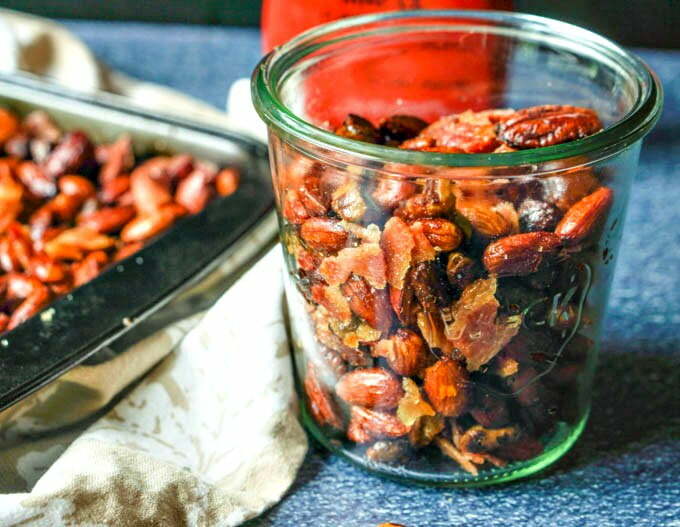 You then want to use the bacon grease to roast the nuts. Firs coat your nuts with the maple syrup and sweetener and them mix them with the bacon grease. Roast in the oven and then add the cooked bacon back at the end. That’s all folks! You can make this using regular maple syrup instead of the sugar free version however it will be high in carbs. If you don’t care, use the same amount of regular syrup as you would with the sugar free, and eliminate the sweetener. So all you need are the nuts, bacon and maple syrup. Above you can see what the mix looks like close up. I used 2 bags of the Aldi nut mix in this recipe. It makes 2 cups and each serving is 1/4 cup of the mixture. You can use more bacon or different nuts, just make sure you check the labels if you are concerned about carb counts. Lay the 6 pieces of bacon out on a cookie sheet. Place into preheated oven and cook for about 30 minutes until the bacon is crispy. Watch that it doesn't burn. Take out the bacon, crumble it and set aside. Take the nuts and coat them with the maple syrup and sweetener. Place the nuts on the cookie sheet and mix in the bacon grease. Spread the nuts evenly on the cookie sheet, turn the oven down to 325 degrees and bake for about 20 minutes until the nuts are nice and browned but not burnt. Let cool down completely for a few hours so they can harden. Store in an airtight container in the refrigerator. NOTE: If not low carb, use real maple syrup in the same amount and disregard the extra sweetener. You can use substitutes for the Lakanto maple syrup. Please read post for other ideas. 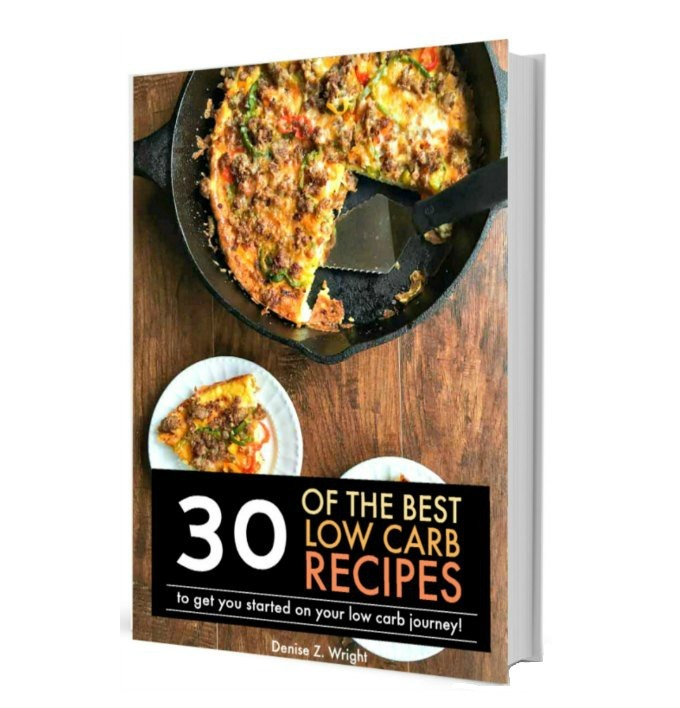 Previous Post: « Low Carb Cajun Stir Fry Skillet Dinner in less than 30 minutes!